The second solo Hawaiian kahiko oli and chant album from Kumu Hula Sylvia Puananiha'aheo Edgar. A selection of oli & chant that honor Akua (God) and many of the Ali'i (Royalty) of Hawai'i. 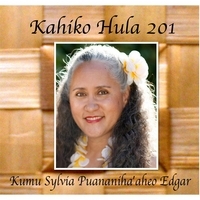 Kahiko Hula 201 is the second solo chant album by Kumu Hula Sylvia Puananiha'aheo Edgar. It is made up of oli and chants that honor Akua (God) and the Ali'i (Royalty) of Hawai'i. These chants are near and dear to Kumu Sylvia's heart. The Ali'i that are honored on this album are Queen Emma Kaleleonalani, King David Kalakaua, Queen Julia Kapi'olani Napela-Kapu-o-Kaka'e and Queen Lydia Lili'uokalani Loloku Walania Kamaka'eha. The Bonus Track is for na haumana (students) of hula who wish to dance a hula exercise warm-up. First, Mahalo nui loa to Ke Akua for all of his blessings to me, my 'ohana, and my haumana. Mahalo nui loa to my two Kumu Hula, the late Kahu Hienie Kalehualaha`ole Blaisdell and my present Kumu, Loea Kawaikapuokalani Hewett for training me in the traditions of Hawaiian Kahiko Hula. Also, this is an album for others who love to listen to Hawaiian chant and enjoy hula. I have had the great pleasure to work and share this project with my husband, Lowell Edgar, my daughter, Nani Edgar, and my haumana and dear friends, Rona Koe, Luana Rivera Palacio, Queena Coursen, Elyse Koe, and Lorien Sanders. Mahalo ladies, and Nani, for chanting the kahea on each of the mele and also lending your beautiful voices on the oli. Maika'i! A special mahalo to Lowell for always being there for me and supporting my passion for hula and my Hawaiian culture.....you are da bests!